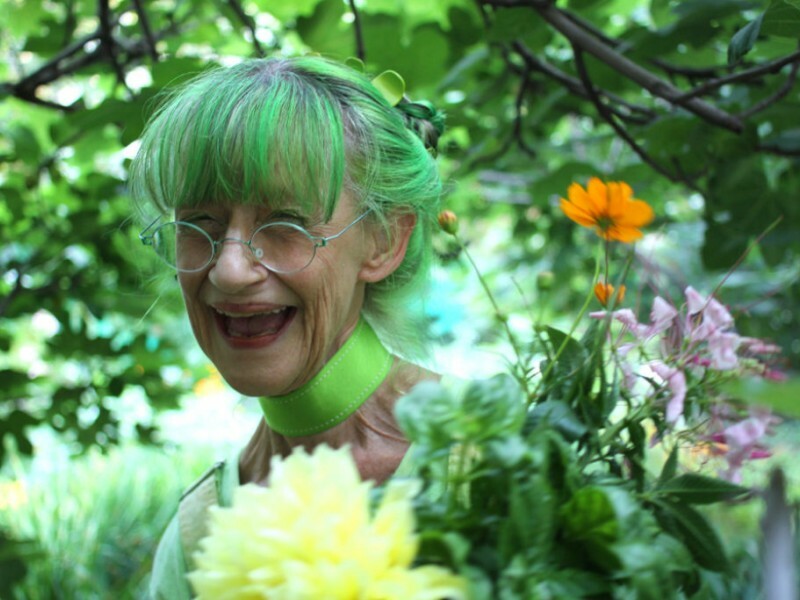 Elizabeth Sweetheart, 74, is known in her area of Brooklyn as the Green Lady of Carroll Gardens for her evergreen approach to life. 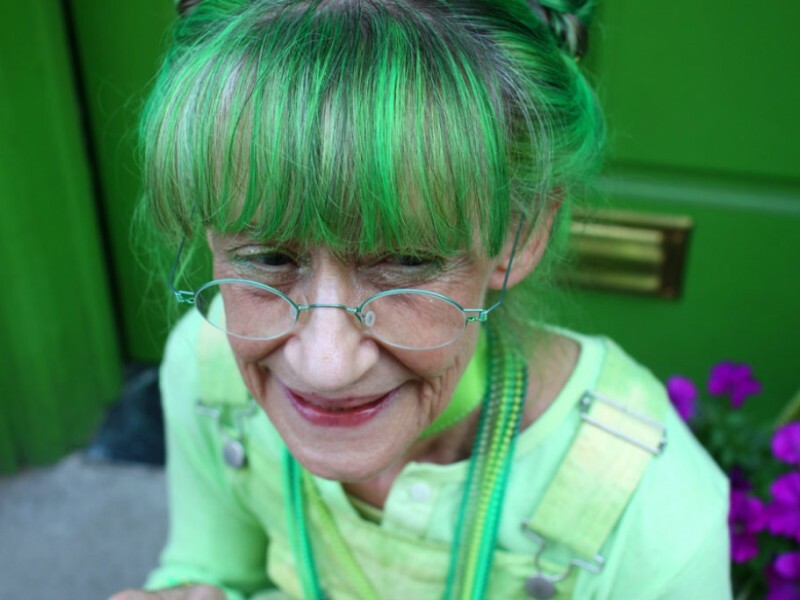 For the past 20 years or so, she has dressed head to toe in a bright lime green, with hair dyed to match. 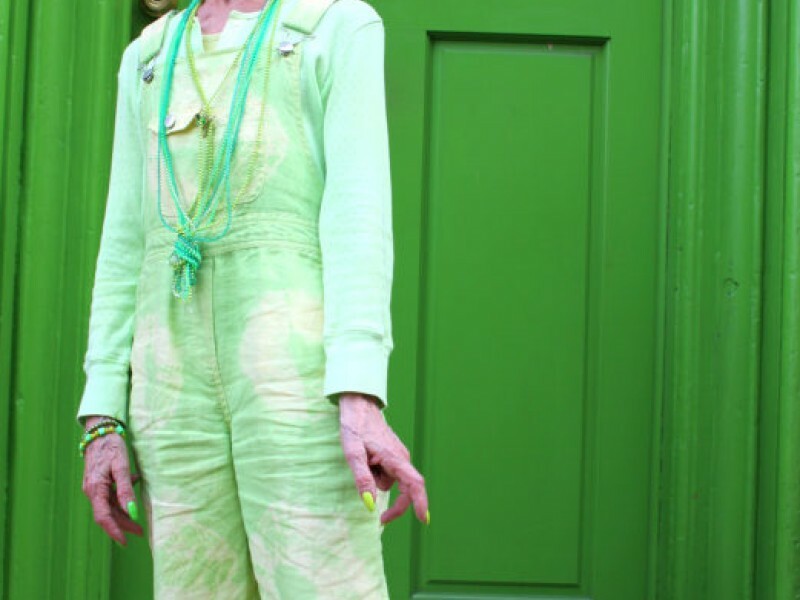 “I’ve just become green — I can’t wear any other color,” she said at her townhouse on Nelson Street, where the front door, back door and staircase flower pots were painted green to match much of the interior. Her kitchen has a green rug, a green trash can, green utensils, dishes, cutting boards and saucepans. Ms. Sweetheart’s coffee cup, oatmeal carton and vitamin pill case and the sponges in the sink are all green, as were the knobs on the cabinets. “It’s funny how you collect a few things, and then it keeps growing,” said Ms. Sweetheart, a mirthful sprite of a woman, just under 5 feet tall. She is an artist who makes tiny, finely painted watercolors, and has worked for decades creating hand-painted prints for top clothing designers and manufacturers. For years she was a frequent sight on the F train, attracting comments as she commuted to and from her Manhattan office. “They’ll say, ‘You know, that’s my favorite color,’ and they’re all wearing black,” said Ms. Sweetheart, who now works from her home, collecting and selling vintage material. 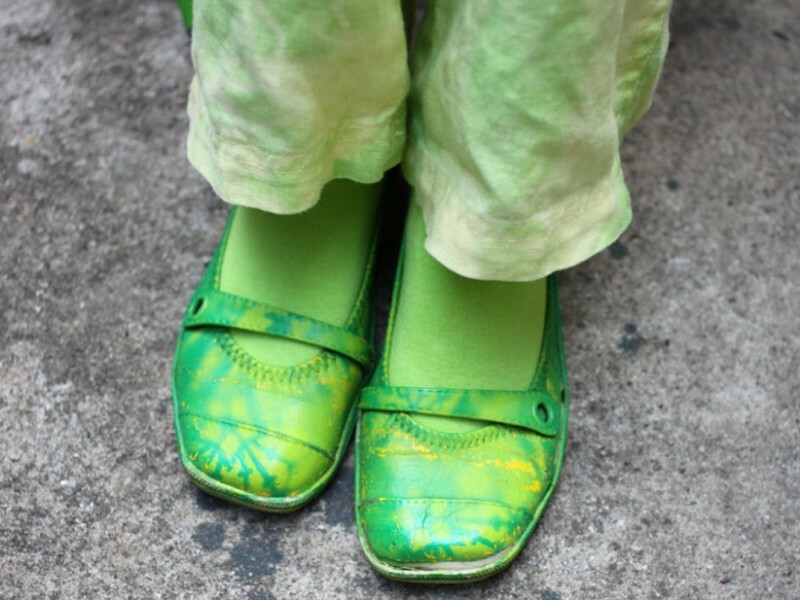 Her outfits seem to emanate a green glow, from her socks and slippers up to her pants, shirt and neckerchief. She has the green highlights in her hair, which are styled into emerald bangs and braided buns fastened with green hair clips. Behind glasses with green frames, she is matching the eye shadow. 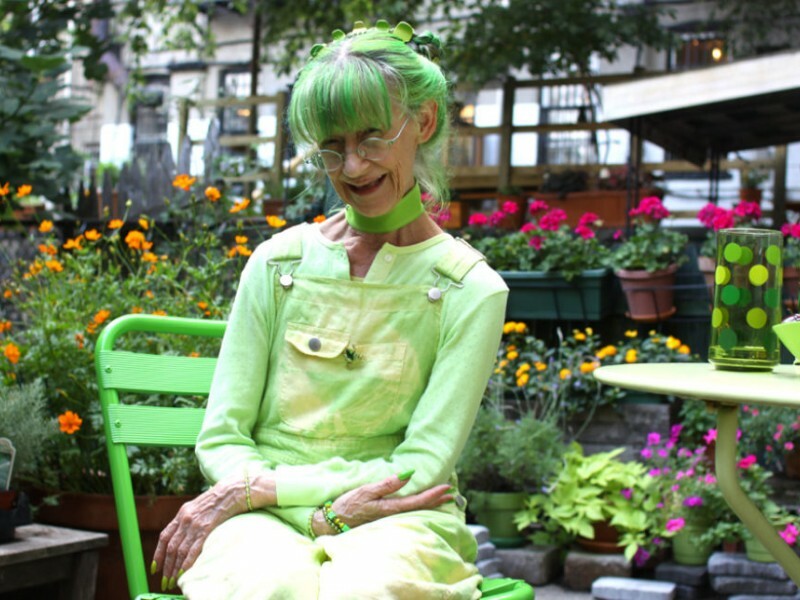 “I’m always doing things to keep happy, and green is just the most positive color, and the happiest,” said Ms. Sweetheart, who is hard to miss in the neighborhood as she runs her daily errands. For years, she was known for walking the family dog, a golden retriever named Dylan, on a green leash. At one point, Ms. Sweetheart tried dying Dylan’s fur green, but her son, Sam Eaton, a mentalist, vetoed that idea. “If you Google green lady and Brooklyn, you’ll find the Statue of Liberty and my mother,” said Mr. Eaton, who lives upstairs and had come down to the kitchen. On the table were green Post-its and outgoing mail bearing Ms. Sweetheart’s return address stamped in green ink. She pulled out her passport. She had green hair in the photo, and it was signed in green ink. Ms. Sweetheart said she was born Elizabeth Eaton in Nova Scotia and raised by her grandparents in a cabin near the Bay of Fundy, where her grandmother taught her to paint and make clothing. In college, she studied with the Canadian painter Alex Colville. In 1964, she hitchhiked to New York City to establish herself as an artist and found work creating prints in the garment industry. For years, she enjoyed wearing vintage dresses and self-designed hats and then began favoring outfits in single colors. 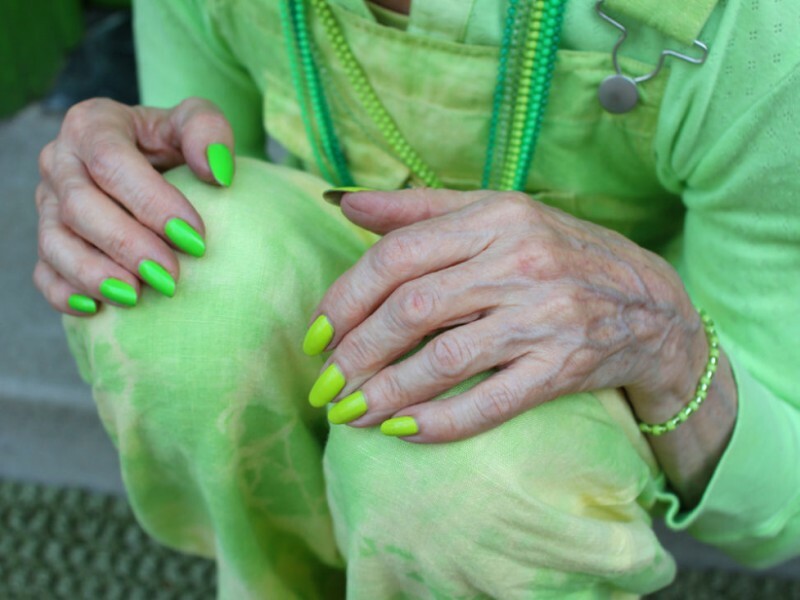 She went through numerous colors before settling on green. “Maybe it was because I grew up in Nova Scotia, and after moving to New York, I missed having green all around me,” she said. On Halloween this year, a girl Ms. Sweetheart had never met rang her bell dressed as Ms. Sweetheart, right down to the green glasses. “She was also my height,” said Ms. Sweetheart, who showed off her bathroom, where green towels hung in the shower. There were hair products in green bottles and bars of green soap. In the bedroom, the bed was made up with green linens. 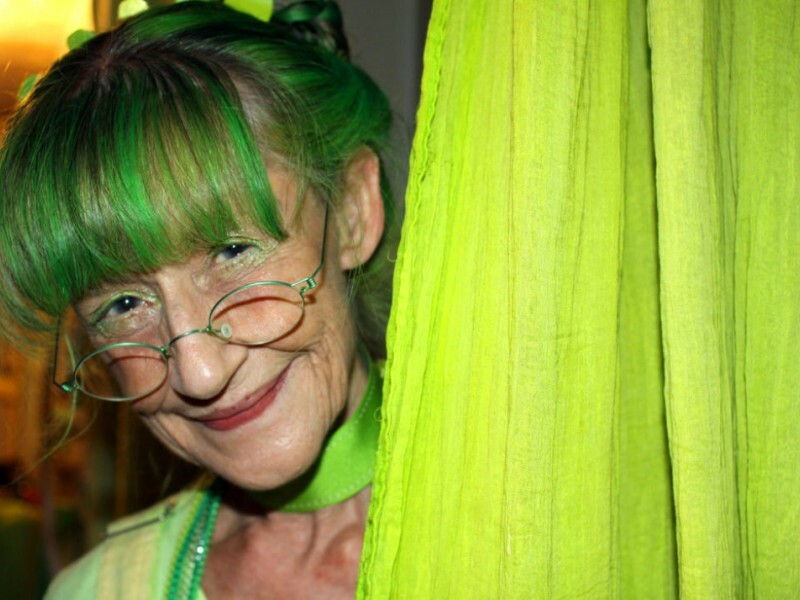 Ms. Sweetheart threw open closets full of green clothing, one with some 30 pairs of green overalls. 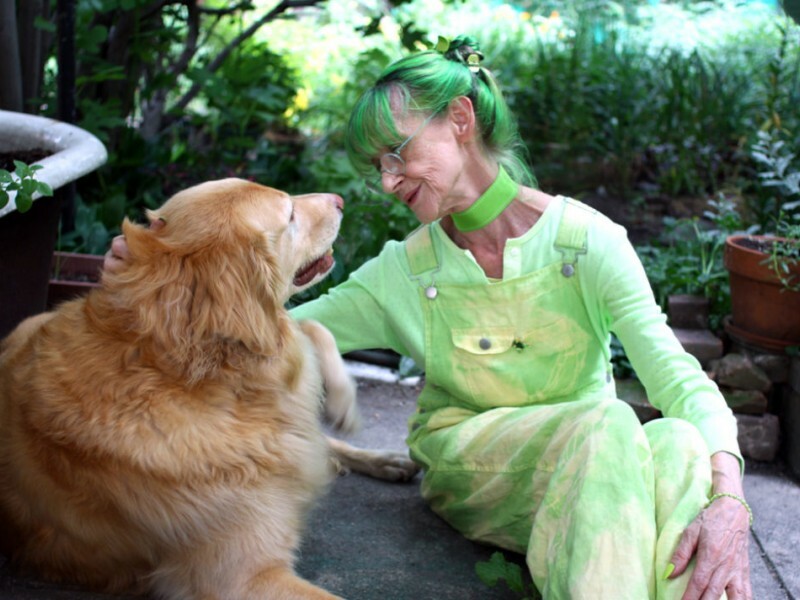 Even her underwear and pajamas are green, said Ms. Sweetheart, whose husband, Robert Rosenthal, is also an artist. She also has a green thumb and a backyard garden that explodes with growth in the summer, from fig trees and tomatoes to eggplants and herbs. Last week, she was busy planting bulbs. The green theme is not simply fun and games, she said. Ms. Sweetheart said, including the recent deaths of both her mother and Dylan, and two operations.